Mapping in the third-dimension is nothing new in cartography. The very earliest maps on clay tablets illustrated mountainscapes by using rudimentary aspect depictions. Perhaps we nowadays think of 3D as detailed cityscapes with photorealistic textures yet this isn’t always the best way to approach a solution for which 3D might be appropriate. One of the key tenets of cartography is, of course, generalization and so reducing complexity to the bare essentials sits at the heart of much of what we do. Detailed satellite base imagery and realistic building renderings are becoming a map-makers preferred approach and it’s inevitable people add stuff to a map if it’s available. Elimination is one of the most important skills a cartographer can master. 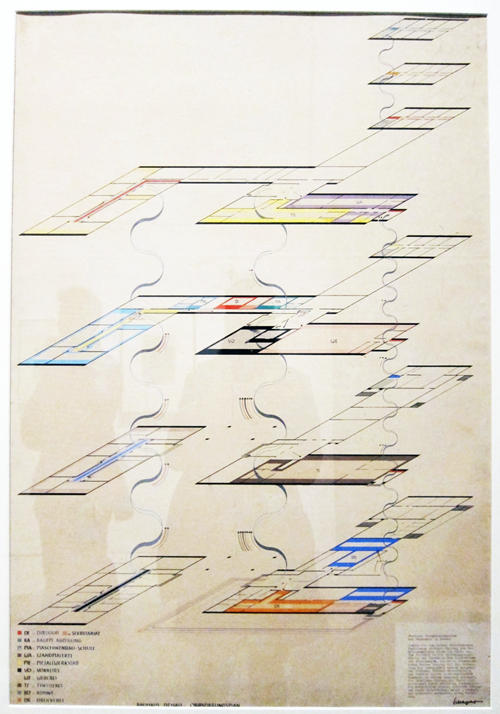 This map, created by Bauhaus teacher Hinnerk Scheper illustrates the principle at work. 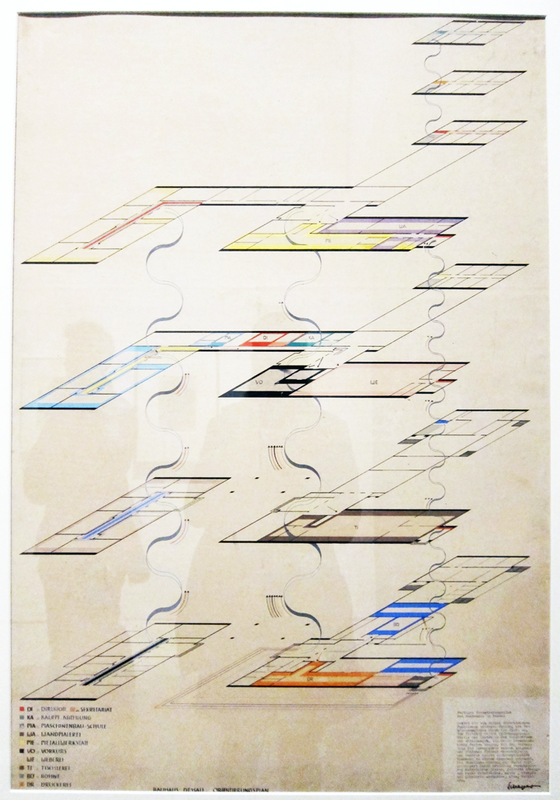 His map is a large scale representation of the orientation and outline plan of the various floors of the Bauhaus building in Dessau, Germany. Floors are shown one on top of another and colour signifies function. The linework is absolutely minimal. Colour is applied internally to each room but not as a complete fill. This gives the work space to breath and reduces the blocks of colour which may overpower the image due to the differently sized rooms. An almost whimsical set of linework connects the floors simply indicating staircases and the front and back of the building is represented with a slightly thicker line. There’s no photorealistic textures. There are no transparent walls. There’s no need for any other landscape detail. It communicates the structure of the building and the function. that’s it. That’s all. Of course, the Bauhaus style has had a profound influence on many aspects of design including architecture, interior design, typography and graphic design. We can learn much from such design approaches to inform our cartography. This entry was posted in MapCarte and tagged abstract, graphic, MapCarte by @kennethfield. Bookmark the permalink.